Glen Elgin distillery first started production in Speyside in 1900. It was a difficult start for the distillery with a number of closures and changes of ownership in it's initial years. Electricity only arrived in 1950 replacing paraffin as the source of power. Under the Diageo umbrella, Glen Elgin is a major contributor to blends, particularly White Horse. 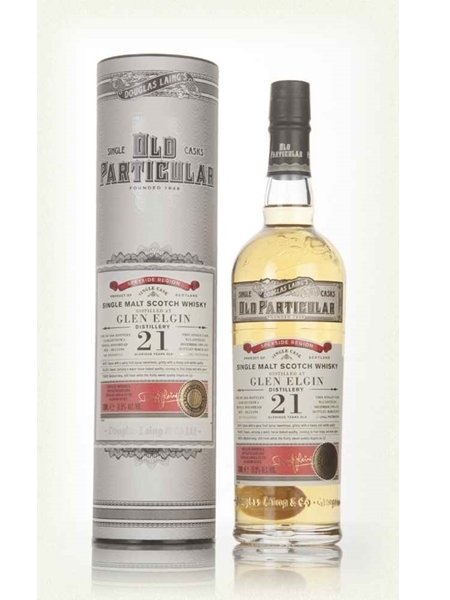 This Douglas Laing selected cask from Glen Elgin is a 21 year old single malt, matured in a refill hogshead yielding 266 bottles at 51.5% ABV.